The original picture was generously contributed by Millie Belew, thanks Millie! Transcribed and submitted by Nancy Bray. And the sowers planted the original Mt. Moriah Christian Church between forks of the Mt. Moriah Road off Highway 17 in Pendleton County, Kentucky. The one room, weather boarded, white church was surrounded with a yard, a walk made of stones, and posts used for hitching horses. The exterior was built similar to that of the Bethel Church which is still standing on Highway 17. The church had two doors, one on each side of the building. The interior contained three sections of benches - a middle section and two sections on each side. The pulpit was built by Jim and Calvin Newkirk. Also situated in the church was a potbelly stove. Although no information had led to the very beginning of Mt. Moriah, an old record indicates that the church property was donated by LaFayette Jones in 1884. In 1909, the Mt. Moriah congregation felt a desire to revitalize its almost dead church. The present preachers, Joe Sargent and Aquilla York, invited William McGarvey Lenox to preach. Lenox was a student minister at Transylvania Bible College in Lexington. He came to Falmouth by train every Saturday and preached Saturday night, Sunday morning, and Sunday night for ten dollars. Usually he did not receive the full salary but preached anyway, even if the payment was fifty cents, vegetables, eggs, or nothing. Rob Cummins, driving his horse "Barney." took Brother Lenox back to the depot at nine P.M. every Sunday night. At Brother Lenox's first service at Mt. Moriah, twenty-five people joined the church. The first song sung was "Glory to His Name" and his first sermon was "A Christless World." Charles LaFollett and Resa Cummns were married on September 23, 1909, the first Mt. Moriah wedding officiated by Brother Lenox. This was one of hundreds of weddings he performed over the years. Some of the memorable families who attended Mt. Moriah were named Newkirk, Fryer, Cummins, Campbell, Dearborn, England, Grizzell, Sargent, Sorrell, Purdy, and York. These people traveled to church in buggies, spring-wagons, and on foot. The women were dressed in hats and long dresses, and the men wore suits and ties. And of course as tradition is seen today, the men sat on the right side and the women on the left. It has been said that so many came to this church, there was not enough room inside; some had to stand outside looking through the windows. Sunday School was always held, whether in the morning of the afternoon. The organist was Cora Cummins, and her sister Lillie directed the singing. Unlike today's services which are relatively calm, services then were often enlivened by a disturbance in the churchyard. For a time on every Sunday two young men, both vying for the attention of the same young lady, chose church time for a showdown. In the winter of 1910, tragedy struck Old Mt. Moriah. During the morning service, people heard a strange noise from the attic. Thinking the noise must have been mice, the congregation ignored it. But while Brother Lenox was eating the noon meal at Charles Fryer's house, the cry was heard. "The Church is on fire!" Immediately everybody was rushing toward the church. Upon arrival, it was too late. The building was in flames and nothing was saved except two benches and the pulpit, which now stands in the rebuilt church. It was determined that a faulty flue had started the fire. Church was not held for a while afterwards. Though old Mt. Moriah was gone, some were determined to keep her going. So the services continued at Mt. Moriah School, where Barney Ashcraft taught. 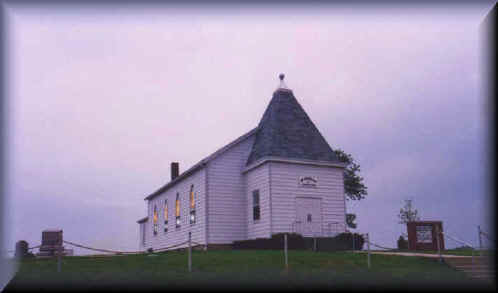 The school was located on Highway 17, not far from the old church site. In the fllowing spring of 1911, a new church was in the process of being built on land donated by Charlie Ruber. The site was located on Highway 17 about one-third mile from Highway 17. Every member donated their lumber and time for completion of the new church. The white-framed, one-room church had a door in the front and four stained glass windows on each side. In the center of the interior sat a potbelly stove, surrounded by dark brown theatre-style seats. Coal oil lamps were used for a while but were later replaced by a Delco plant. On August 29, 1911 a huge Mt. Moriah crowd displayed their pride as they gathered in the new churchyard for a grand dedication day. Brother H. C. Runyan of Latonia was the speaker. Brother Lenox also played a major role in erecting and dedicating the church. Although the new church was unfinished, a collection was taken which paid for the remainder of the new materials. A table was set and a large dinner was served. There were so many in attendance, there was not enough room in the yard for everybody to eat. Some ate at Carrie Purdy's house next door. Church officers at that time were Josiah Sargent, Enoch Sorrell, Charles A Fryer, A. I. York, J. W. Newkirk, William Dearborn, Crayton England, and William Grizzell. Mt. Moriah's fellowship activities included picnics and ice-cream socials. These gatherings were held on the Edward's property at Catawba at the Licking River. Baptisms were held at Falmouth under the wooden bridge on the Licking River. William McGarvey Lenox was considered the life of the church. He was born to William and Esther Lenox on March 26, 1880 in Harrison County, Ky. On the first Sunday in September of 1904, he received his first pastorate at the Ebenezer Christian Church in Mercer County. In 1909 he attended Transylvania Bible College. At that time, Lenox had two girlfriends and performed the difficult task of choosing which one to marry. He chose Adda May McCauley because "she was the smarter", (according to Bro. Lenox) and they were married on June 16, 1909. After graduating in 1911, Lenox continued his preaching at Mt. Moriah. In 1913 he went to Pueblo, Colorado, and ministered five years, returning in 1918. Brother Whitehead of Falmouth served as the intern minister during Lenox's absence. Brother Lenox preached at Mt. Moriah once a month. His other churches were Antioch Mills, forty-three years; Oakland, forty-eight years; Pleasant Hill, twenty years; Fairview, and Colemansville. Besides being a minister, he was also a farmer and teacher. He raised tobacco and taught at Mt. Auburn, McMahon, Pleasant Hill, and Mt. Vernon schools. While he was conducting a funeral or doing another type of ministry work, his wife Adda was the substitute teacher. Lenox was also the master of the Orion Masonic Lodge in Falmouth. August 22 - September 2, 1938 were the days of celebration for the twenty-fifth anniversary of Brother Lenox's ministry with Mt. Moriah. Brother Lenox was pastor and evangelist of this twelve-day event. Church officials at the time were J. W. Newkirk, B. E. Tayor, Lee Bobb, W. N. Dahms, C. W. York, Emert Abercrombie, W. H. Bentle, John Sullivan, Thurman Bryan, Will McGill, and Arthur Loomis. New Mt. Moriah had undergone many changes in the building since its beginning. A vestibule was built which had a door on each side and a window in the front, but was later changed with two doors in the front and a window on each side. More of the structure was changed in the 1950's. Emert Abercrombie and Ed Taylor built the baptistery, which had been strongly recommended by Brother Lenox. Elvin Sampson built a choir loft on the left side of the church. Oil heaters replaced the old stove; and a few years later, a basement was built by Orville O'Neil. At that time, an oil furnace was installed which replaced the heaters. Mt. Moriah had developed activities for its church and community. During World War ll, the church displayed plaques containing the names of those members who were soldiers. A quartet was organized in 1948. Its singers included Mary Doan, Omer Bentle, Leland Bentle, and Lorine Ballinger. The group sang at many community funerals. Also organized in 1948 was a church choir. It was composed of Evelyn Purdy, Cecil Bryan, Dessie Bishop, Carl Brownfield, Leslie Bryan, Clarice Aucter, Charles Sullivan, Mabel Sullivan, Tom Purdy, and Dorothy Sargent as well as the quartet members. Dressed in their white capes and singing from the choir loft, these members' voices were heard every Sunday morning. Shirley Jacob was the pianist for both the choir and quartet. During the Christmas seasons came the Christmas programs. These shows ranged from simple singing sessions to large, curtain-drawn productions. In the summers, children anticipated Bible School, which gave each child a chance to learn about Jesus, make new friends, and to make crafts. The Ladies' Aid was established in July 1936, with Carrie Lovelace as the first president. This active group consisted of Mt. Moriah women who frequently undertook activities to benefit the church. Working from early morning until afternoon, they made quilts for the Widows and Orphans Home. By braiding rugs, making door stops, and having bake sales and rummage sales, they raised money to buy church property such as the stove, swinging doors, and window fixtures. Excluding the quartet, these programs are still in existence today. September 26, 1954 was a grand celebration day for Brother Lenox honoring his fifty years of ministry and forty years at Mt. Moriah. Over three hundred people, mostly from his churches in the county, gathered at Mt. Moriah to honor this outstanding minister. This event came as a complete surprise to Brother Lenox. Dozens of greetings were received from half the states in the Union. After special worship services and speeches of gratitude, the Reverend was presented a bronze plaque stating his fifty years of faithful service. The plaque remains in the church. Afterwards a noon dinner was served. Situated on the table was a huge cake trimmed in white and gold lettered with "50th Anniversary." Being in the ministry sixty years, William McGarvey Lenox retired in 1966, having served Mt. Moriah fifty years. He was loved by the community and will be remembered for his wonderful service. He had conducted innumerable weddings, funerals and baptisms. Brother Lenox died on March 18, 1969. Part of his estate was willed to Mt. Moriah. Adda died in 1980. But Mt. Moriah still lives. Succeeding ministers were Jim Powell, Bill Horton, Dr. Lester Rampley, David Edwards, Mark Prevo, Chuck Behrens, and Steve Vandergrift. These preachers came from the Lexington Theological Seminary. "They that sow in tears shall reap in joy." The members who love their church sowed their service in hopes that the youth will reap and keep the church growing throughout the ages. Though there were tearful times, sowers and reapers today shout in joy, 'Tis That Old Mt. Moriah Religion!"